Working on some Halloween pieces for the EHAG Emporium, an online sales blog for the members of the Eclectic Halloween Artists Guild. 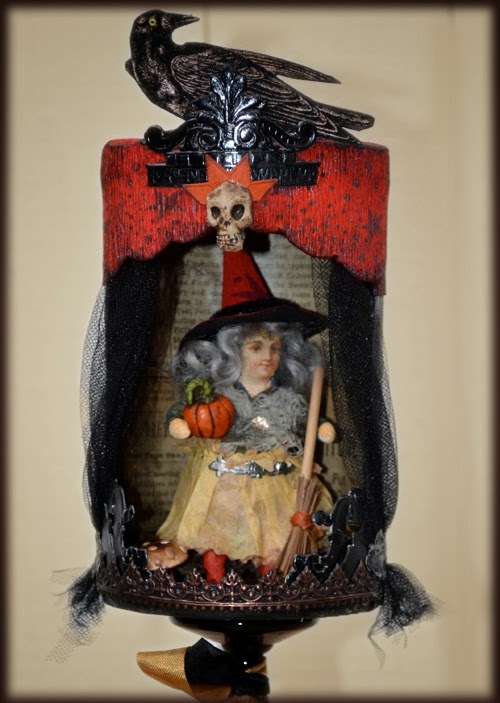 If you head on over to my Halloween blog, there are more photos and further details about this miniature spun cotton witch theater. I always love adding lots of tiny touches that make each piece truly unique! Additionally, I am getting into the spirit of October 31 for shows in fall. Yes, I am working now on pieces for my September and October shows, and for blog sales along the way. The weather is cool and breezy here, just like fall. So it's easy to imagine fall is right around the corner. Enjoy the coming spring and the EHAG Emporium blog sale!